From the button, Suad Kantarevic moved all in for 880,000 at 20,000/40,000 blinds. The big blind made the call with [As][Kh] and was dominating Suad's [Ad][9h]. The [Qh][Js][Qc] gave Suad some outs to chop, but the [Td] turn gave his opponent a straight. He could still chop with a king, but the river fell the [Jh] instead. Suad will exit this tournament in 12th place, good for $6,198. Frankie Flowers raised preflop before Je Wook Oh re-raised. Frankie called, and then moved all in on the 6-6-3 flop. Je Wook elected to call, showing A-K, but Frankie had the best hand with pocket fives. A five on the turn sealed Je Wook's fate, eliminating him in 13th place. He will collect $5,214 for his efforts. Robert Negrotti moved all in and was snap called by his opponent holding [As][Ad]. Robert was in bad shape with his [Ac][Kd], and the [6s][Qd][9h][5c][7c] offered him no help. Robert will take home $5,214 for his 14th place finish. Leonard Estabrooks was all in preflop holding A-Q against the [9s][9c] of Frankie Flowers. The two nines held up to send Leonard to the rail in 15th place, good for $4,624. 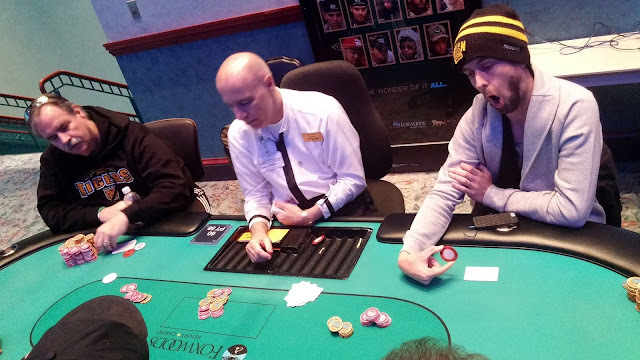 Donald Schneider was all in preflop holding [As][Qh] and ran into [Ah][Ad]. The board ran out [2h][5d][9c][6h][7d] to keep the aces in front. Donald will be eliminated in 16th place, good for $4,624. Thomas Sonnet moved all in from middle position and was called by the player to his left. Action folded to the big blind, but before he could act, Thomas exposed his [8s][8h]. The big blind folded, and Thomas's opponent showed [Th][Td]. The board ran out [5h][6c][2c][Ac][Kh] and the pocket tens held up. Thomas will exit this tournament in 17th place, good for $4,624. After the redraw, we did a quick chip count of the remaining players. We will fill in the names as we get them. 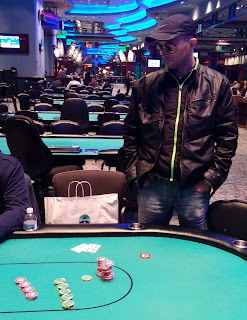 Anothony Larocca has been eliminated in 19th place with jacks against A-J, leaving the remaining 18 players to redraw for seats at the final two tables. They will resume play for 3 more minutes and then take a 15 minute break. Je Wook Oh opened from the small blind and the big blind made the call. On the [tc][8s][td] flop, Je Wook Oh checked and saw the big blind move all in for 811,000, which was around eight times the pot. Je Wook snap called with his [ah][ad], and he was way ahead as his opponent was bluffing with [kd][jh] and had no outs. The [qs] on the turn gave Je Wook's opponent a king high straight draw, as an ace would give Je Wook a full house. Amazingly, the [9s] hit the river to complete his opponent's straight. After paying off the all in, Je Wook was left with under 400,000. Bobby Corcione was all in holding A-7 and was called by Q-J. By the turn, Bobby's opponent had made a straight to send him to the rail in 24th place. He will collect $3,443 for his efforts. With the elimination of Jiqiang Tong in 28th Place, Event #1 is now down to the final 3 tables. There is no redraw until the final 18 players, so a table will be broken and play will continue. In 3 minutes, the final 27 players will be on a 1 hour dinner break. We didn't see the preflop action, but the flop was 8-6-5 and Raj Patel checked to Frankie Flowers. Frankie bet and the other player in the pot called before Raj moved all in. Frankie folded and the other player snap called. Raj held top set, but his opponent had flopped a straight with 7-4. The board failed to pair, and Raj will exit this tournament in 31st place. With 33 players remaining, the blinds are currently 6,000/12,000 with a 2,000 ante. 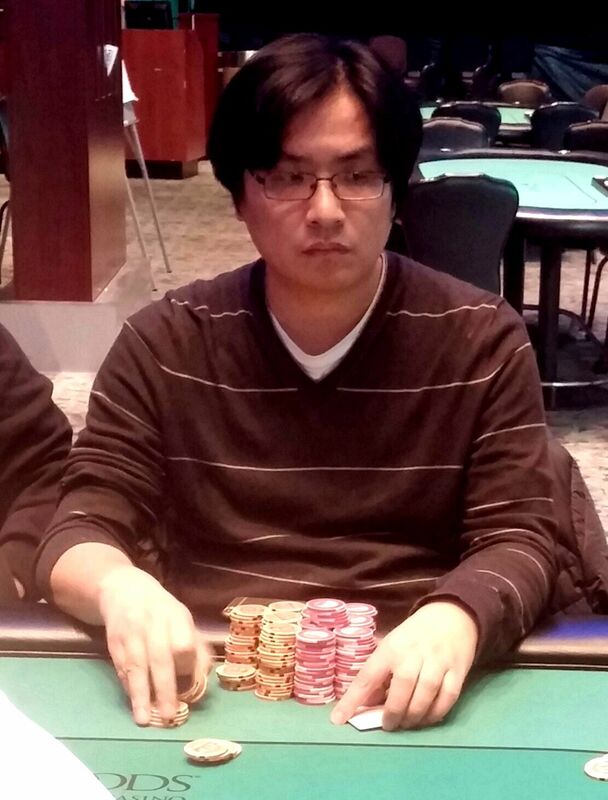 We follow Je Wook Oh for an orbit, starting with him in the big blind. 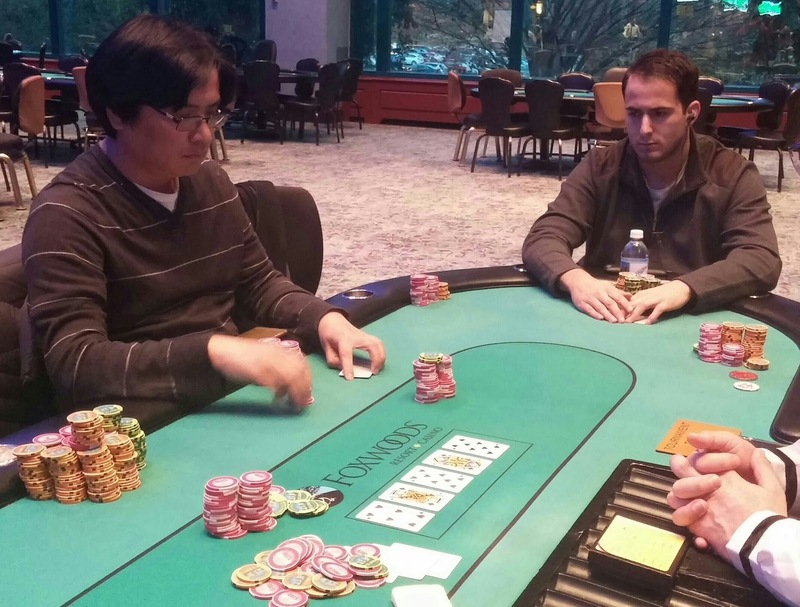 Hand 1: The player in the hijack opens and Je Wook defends his big blind. The two check the [2s][qh][ah] flop, and then Je Wook check-folds the [2d] turn. Hand 2: There is some controversy on the antes, but finally a hand is dealt. Action folds to Je Wook in the small blind, and he limps. The big blind checks and the two check down a [jh][5d][6d][3s][ts] board. Je Wook wins the pot with [kh][6h]. Hand 3: UTG raises to 28,000 and the cutoff makes the call. Je Wook and the small blind fold, and Don Fisher in the big blind calls. UTG c-bets 42,000 on the [2d][jc][ac] flop only to see Don check raise all in. UTG folds, and Don wins the pot. Hand 4: The hijack raises to 27,000 and the big blind calls. The flop falls [5h][jc][qs] and both players check. The [4c] falls on the turn and the big blind check folds to a delayed c-bet. Hand 5: Dave Collin in UTG+1 raises to 30,000 and the cutoff moves all in. The big blind asks for a count and is told 229,000. He folds, but Dave makes the call with [ac][kc]. The cutoff is in bad shape with his [as][7s], and the [3d][kh][qh] leaves him drawing to runner runner. 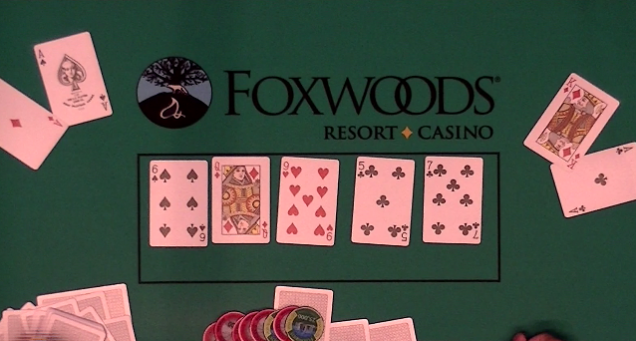 The [6s] turn gives him a backdoor flush draw, and the [9s] river completes that draw. Dave requests the hand go on the blog since people never believe him. 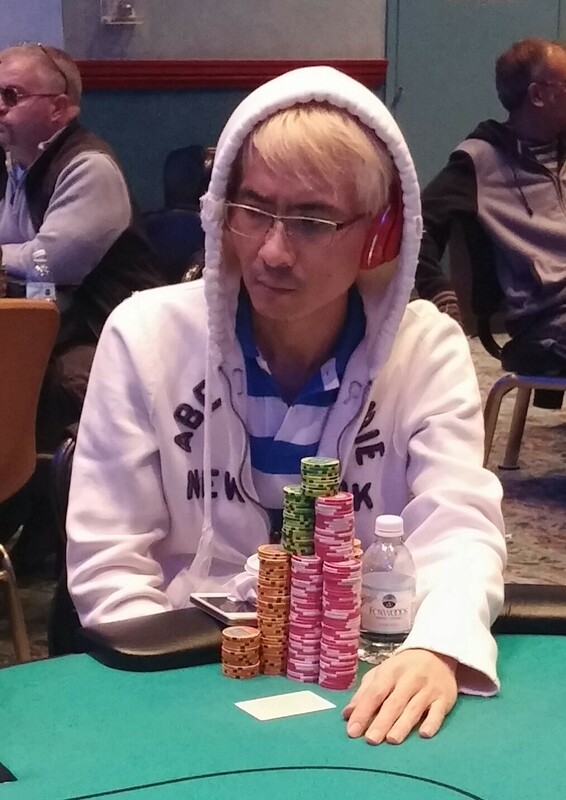 Hand 6: Je Wook raises to 26,000 from middle position and the button and both blinds make the call. The flop falls [qs][4d][jd] and all four players check. The [8c] lands on the turn, and this time everyone checks to the button who bets 40,000. The blinds fold and Je Wook makes the call. Heads up the [3h] fiver goes check check and the button shows [qc][5c]. Je Wook re-checks his cards and mucks. Hand 7: All players fold to Don Fisher who raises and takes done the blinds and antes. He flashes the [ah] to his table mates. Hand 8: Je Wook is under the gun and folds. UTG+1 limps, as does the button and Dave Collin in the small blind. The big blind checks and the dealer spreads the [qs][as][6h] flop. All four players check to the [9d] turn, and Dave leads for 40,000. Only UTG+1 makes the call. The [6c] river prompts a 50,000 bet from Dave, and that bet is called. Dave says "I have an ace" as he shows [ah][4c]. That's enough to win the pot. On the last hand before break, Jiqiang Tong was heads up against his opponent. The board read [6h][Jd][8h][Qd] and Jiqiang check-raised to 200,000. His opponent called, and the river was the [8s]. 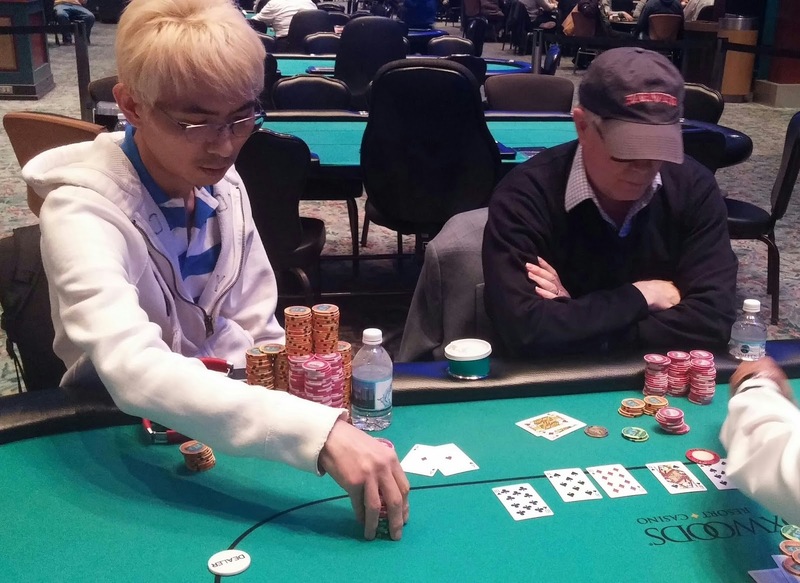 Jiqiang kept the betting lead and bet 275,000, which got his opponent to fold. Heading into break, 34 players remain. 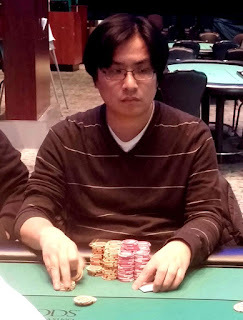 Jiqiang is in the top 5 with his 1,040,000 chips. With the player in the big blind on penalty and away from the table, Frankie Flowers opened to 32,000 at 5,000/10,000. The player on the button called, and Tim Reilly moved all in for not much more from the small blind. Frankie snap folded, and the button called with [Kh][Js]. Tim was ahead with his [As][Th] but would need to dodge some cards. The [Kd][4d][6h] flop wasn't good news for him, but the queen on the turn opened some more outs from him. The river bricked, however, and Tim will be eliminated in 45th place. With 200,000 already in the middle, the board read [6s][5s][9h][Th] and Frankie Flowers checked to his lone opponent. The bet was 140,000, to which Frankie responded with an all in shove. His opponent thought for awhile, but eventually laid it down. Frankie showed the [Jd], telling his opponent he put him on ace king. After that hand, Frankie stacked his chips and discovered he had 800,000, which is good for the chip lead with 50 players remaining. While there are quite a few stacks over 500,000, everyone is chasing Jiqiang Tong with 740,000. On the last hand before break, he knocked out two players in the same hand when he made a full house with his pocket sixes. Frankie Flowers, just to Jiqiang's right, is right behind him with 630,000. 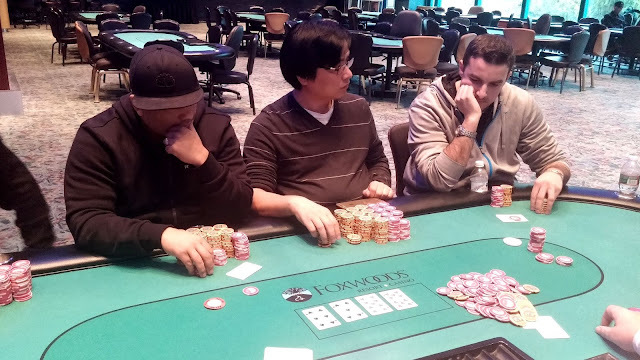 Je Wook Oh is still sitting pretty with 440,000, Raj Patel sits on a comfortable 210,000, but Don Fisher has them both outchipped with 460,000. 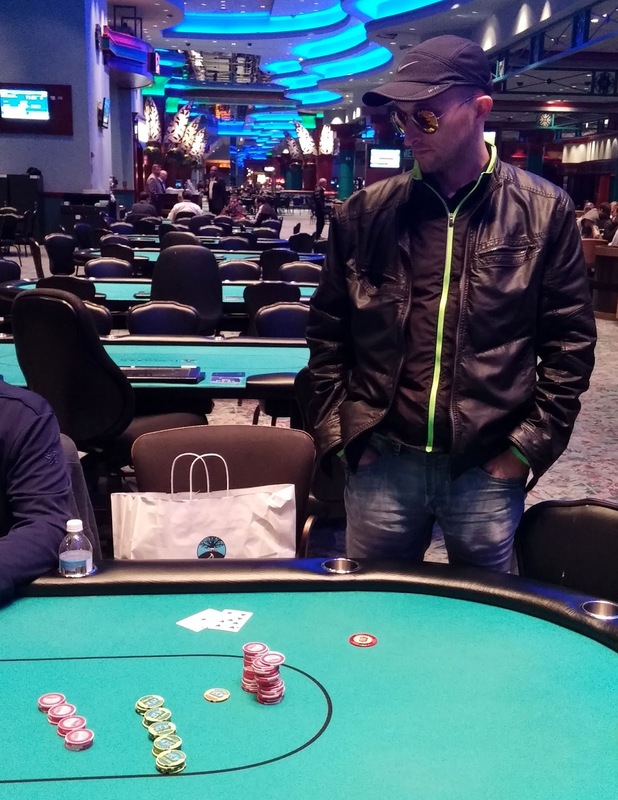 Tim Reilly has some work to do, sitting on a short stack of just 110,000. Just 67 players remain in Day 2 of Event #1, and they are now on their first break of the day. Blinds will be 4,000/8,000 with a 1,000 ante when play resumes. Cards are in the air for Event #3 $300 NLH Big Stack. Meanwhile, the final 115 players from Event #1 $600 NLH are also resuming play for Day 2. You can watch the live stream of the feature table at www.FoxwoodsLive.com. Registration will remain open until the start of level 11 (approximately 3:50pm). There is a 45 minute dinner break after Level 20 (approximately 7:25pm). Day 2 levels will be 60 minutes. Two players went out on the same hand in hand-for-hand play, bringing the 51 remaining players into the money and on to Day 2. 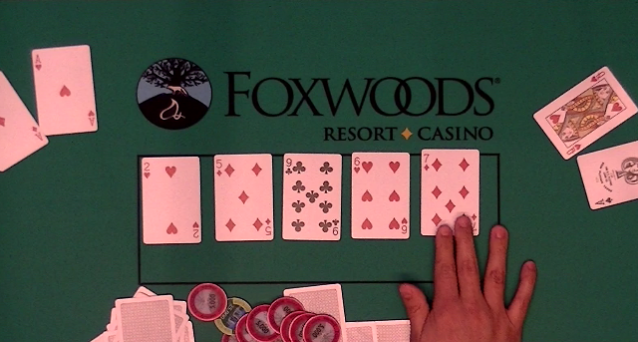 In one hand, three players saw a 10-2-2 flop, and two players got it in. One had [Qh][Th] and the other had [Js][2s]. The trip deuces held up to eliminate the other player. 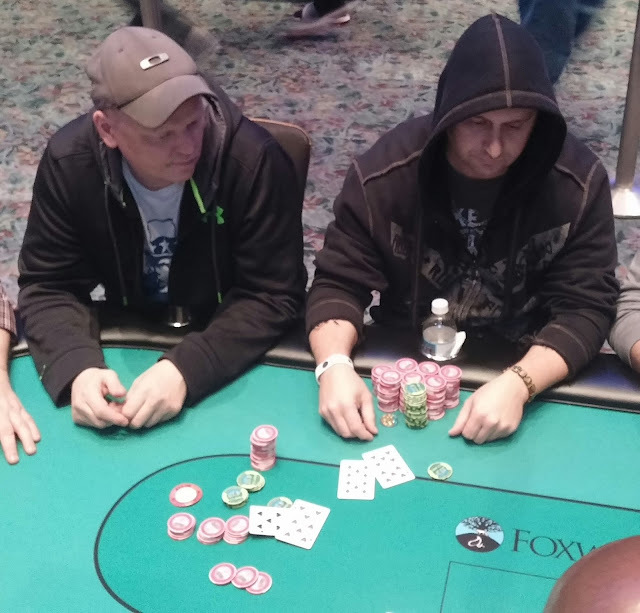 On another table, two players saw a 10-10-9 flop, and the shorter stack moved all in with Q-9. The other player called with a flopped full house, holding the last two remaining nines. No miracle came to save that player's tournament life. Since the two went out on the same hand, they will chop the minimum cash, getting $615 each. A full list of returning players from all flights combined will be posted shortly, along with seating assignments. Play will resume at 12pm EST.